We’re often overloaded with EDC gear these days. Our pockets are bulging at the seams with countless gadgets, gizmos and essential tools like pocket knives. With pocket and pack space at a premium, it’s no longer good-enough for a product to be effective at its intended purpose – it needs to be well designed too and that means keeping the weight down. When it comes to knives, a useful measure we monitor is the blade-length-to-weight ratio, which puts an objective number on how much punch a knife fits in a package. As much as we’d like to carry around a beefy 8-ounce full titanium slab of a folding knife with a 4” blade, a lot of the time it’s more annoying that helpful. A huge knife that weighs down on your pants pocket is not very ‘EDC’. So here’s our take on the best lightweight EDC’s that pack a punch in a package you’ll forget is even there.. The Delica is a long time fan favorite from Spyderco, alongside other worthy models like the Endura (1.03 ratio), the Stretch (0.95 ratio) and the frequently loved-upon PM2 (0.92.) Our favorite Delica 4 sports the somewhat unconventional ZDP-189 high-end steel. Hitachi ZDP-189 is still one of the highest-performing cutlery steels even though it’s been on the market for a relatively long time. ZDP-189 has insanely high carbon content – more than 50% higher than modern powdered super steels like CTS-204p or Bohler M390 – and virtually no Vanadium. It tests out at 64-65 on the Rockwell hardness scale, which is basically unmatched among production steels today and yields a blade that stays sharp for an incredibly long time. It’s not so strong on corrosion resistance – despite having over the minimum chromium content to be considered stainless – so be careful when using it with acidic foods. Like most user-oriented Spyderco’s, the focus is on ergonomics. The Delica is a lockback with a Boye detent to prevent accidental lock release, and it’s designed for use as a hunting knife. A full-flat-ground drop point blade makes detail work natural, and a shallow forward choil provides a solid choked up grip, while thumb ramp jimping keeps your hand in place up top. As with most other lightweight Spydercos, the Delica features FRN (fiberglass reinforced nylon) scales with bi-directional texturing for a solid grip, on top of nested skeletonized stainless liners for strength. Mounting holes allow the clip to be positioned 4 different ways. At only 2.5 ounces, the Delica breaks the magic 1.00 blade:weight ratio that we’ll call “the sweet spot” for weight – strong enough to rely on, light enough to forget it’s there, and with an exotic high end steel – it’s a formidable choice. If I told you that someone recently released a knife that was a design collaboration with professional wrestler and notorious public figure “Stone Cold” Steve Austin, you might not have high hopes for its quality or design. If I told you it was Cold Steel making it, your expectations might be even lower. So it’s somewhat surprising that the byproduct of this unholy marriage is… a very practical EDC knife that’s long on design and short on BS! Terrible name aside this new folder from the folks at Cold Steel is further proof that Lynn Thompson & Co are now more interested in making actually good knives than appeasing the tastes of truck stop buyers and mall ninjas – which is good news for everyone. For starters, the ratios on this knife are amazing: 4” of blade weighing in at a hair over three ounces is a very efficient package. Cold Steel didn’t skimp on materials either: the blade – a full hollow ground clip point – is made of Carpenter CTS-XHP steel, which Cold Steel has been gradually transitioning to from their old standby of AUS-8A. XHP is a surprise given the price point, and is sure to hold an edge and resist rust extremely well – especially with the somewhat unnecessary black coating on the blade. Andrew Demko’s super-strong Tri-Ad lock makes another appearance here – with a stop pin sandwiched between the lock bar and the tang of the blade eliminating flex and wear between the two surfaces, as well as providing a satisfying “thwack” when opened. The handles are liner-less G10, available in a wide array of colors – Hi-Viz Orange, Coyote Tan, OD Green, Bright Blue, Grey, and Pink (for the ladies!) to suit any taste. A deep carry pocket clip is configured for ambidextrous tip up carry, and really the only thing to worry about is how you’re going to remove the giant “broken skull” letters from the blade without ruining the finish. Maybe it’s time to break some skulls! Or open some boxes and cut some apples. Up to you. The Al Mar Ultralight series is the undisputed champion of the lightweight EDC game – provided you’re willing to make a few sacrifices towards the pillar of lightness. Their blade to weight ratios are basically unmatched among modern folding knives. For comparison, the 2.75” Hawk Ultralight weighs in at 1.00 oz while ZT’s 2.75” offering – the 0900 – weighs 4.30 oz. So the blade to weight ratios balance out at 2.75:1 and 0.63:1 – or put plainly, the Al Mar packs more than 4.5 times more blade length per ounce than ZT’s “compact” offering. Getting to that sort of insane ratio requires some drastic measures, and the Al Mar Ultralights take all of them. The handles are contoured linen Micarta – and no, there aren’t liners. While Micarta is epoxy-impregnated, it is still somewhat susceptible to moisture intrusion, so if you live on a riverboat in Louisiana in the summer this is not the knife for you – it can be just as hard to open on a sweltering day as an Opinel, and you don’t want to look like the knife hipster that can’t open his knife. The Ultralights all use a lockback mechanism that Al Mar calls a front lock – since it’s between the pivot and the midpoint – and under good conditions and after a bit of a break-in period they open with incredible smoothness via a thumb stud. Lightweights come in three sizes and two blade shapes – the Hawk has a 2.75” blade, the Falcon has a 3.15” blade, and the Eagle has a full 4” blade. Standard variants are full flat ground, while Talon variants are spear-point with a false swedge. All models are made of AUS-8, which is… easy to sharpen. Let’s be honest: Al Mar needs to start using better steel – AUS-8 was mediocre ten years ago, and with Cold Steel shipping out blades in CTS-XHP, it’s time for a change! Still, packing 3 1/8” of blade into a 1.25 ounce package with a real lock and a pocket clip is basically magic – especially once you become familiar with how impeccable Al Mar’s fit and finish is, making every opportunity to use one a true joy. If you want something a little stouter, there is a Heavy Duty version of the Eagle Talon model with G10 scales over stainless liners, an adjustable pivot, and the availability of a ZDP-189 blade – weighing in at only 3.00 ounces. Hardly “heavy” duty! It’s a Delica, it’s an Endura, it’s a – wait, that’s not a Spyderco. Interesting! The Patriot is Boker’s first knife made in the United States (by Fox Cutlery USA, a subsidiary of the Italian-owned Fox Cutlery) and it’s a shot over the bow at Spyderco’s lightweight mainstays of the EDC market. In fact, it bears a striking resemblance to the Delica in a lot of ways – most obvious being the GFN (glass filled nylon) handles with pronounced texturing for a secure grip. The Patriot skips the stainless liners for weight savings – ringing in at a scant 2.11 ounces – but still packs a deep four finger grip as well as a partial forward choil. A lockback secures the blade when open. The blade itself is a drop point shape with a high flat grind made of 154CM – a good quality US-sourced mid-range steel. A thumb stud does the opening duties. What’s interesting about the Patriot is how much blade it packs in – while it’s handle is 1/8” shorter than the Delica (4.125” versus 4.25”) the blade is actually 1/2“ longer (3.375” versus 2.875”) making the Patriot an impressively efficient design. A deep-carry pocket clip can be oriented left or right hand tip up. While all Patriots share the same dimensions, you have the choice of a few colors – Blue, Black or Orange with a satin finish blade as well as coyote brown with a stonewashed blade. There’s also a black handled version with a partial-serrated black coated blade if that’s your thing. The Patriot offers a US-made alternative to the standard Delica and Endura with some unique features – it will be interesting to see what designer Raimund Lhotak comes up with next! The Leek is part of Ken Onion’s series of onion-related-named models he made for the Kershaw brand during his time working there from 1996-2010 (which also included the Scallion, Chive, and Shallot) and is one of the best-known and best-selling Kershaw models ever. Even people who aren’t “knife people” are likely to have seen one before. It’s been in production for an eternity, with no signs of slowing down. Why is it so popular? Well, it’s light, useful, fun to operate, and unique. Leeks are made with liner locks – which weigh in at 2.50oz – and frame locks – which weigh 3.00 ounces. All except for the Random Leek have a needle-pointed Wharncliffe blade, which is strange to the eye but is extremely useful in day to day utility tasks as well as for food prep. The hallmark of the Leek is its Speedsafe assisted opening mechanism – which seems incredibly commonplace now, but was a revolutionary idea that Onion spearheaded for Kershaw. In order to skirt arcane laws relating to possession and use of switchblades and “gravity knives” Onion created a torsion bar system that legally fulfills the same tasks. The spring is hidden inside the scale which is connected to the blade tang and the frame itself, and acts both as a closed detent and snaps the blade open once it’s been opened manually the first 10% or so of its travel. In practice, it is just as fast as an automatic knife – but by the letter of the law it’s legal. While the enthusiast market has moved on from assisted knives as being more of a gimmick than a feature, in a knife with a super-light blade like the Leek it would be borderline impossible to make a good manual flipper without an uncomfortably hard detent. There is also a “tip lock” mechanism built into the end of the handle which prevents the blade from accidentally opening in your pocket, which is usually forgotten about shortly after acquiring the knife. So with a pull of the flipper tab the 3” blade snaps out, and in doing so has created a whole new generation of knife fanatics – pulled in by the Speedsafe action into a lifetime of knife addiction. And that’s OK, because the Leek is still a great knife – thinner than a cell phone, only a half-ounce heavier than a Zippo, sharper than Louis CK’s sarcasm, you can’t go wrong with a Leek in your pocket. Whether it’s a standard model – a liner lock with Sandvik 14C28N steel and brightly colored aluminum handles, or an upgraded model such as the exotic composite blade – which melds a spine of 13C26 steel and a sharpened end of D2 steel sintered together with copper, or the new Carbon Fiber leek with a stonewashed CPM-154 blade and carbon fiber laminate G10 scales. Regardless, you’ll have a timeless piece of knife design from one of the true masters of the field – and you might even forget it’s in your pocket. The Ripple was Ken Onion’s first design for Columbia River Knife and Tool (CRKT) when he migrated there from KAI (Kershaw/Zero Tolerance) in 2010 – and he swung for the fences. There are two different sizes of the Ripple, but here we’re focusing on the original Ripple with its 3.125” blade – versus the smaller Ripple 2 with a 2.78” blade, which isn’t much lighter. Like many CRKT products, the Ripple is available in two “trim levels” – a more affordable model with aluminum handles and a liner lock with an 8Cr14MoV blade, or a premium version with stainless steel handles, an integrated framelock, and a premium Acuto+ stainless steel blade. While the Stainless version is slightly heavier, it still falls over the ratio sweet spot at 1.05:1, and to us the extra half ounce is worth it for the stronger lock and the impressive machining that blends the lock bar into the pattern milled into the handle. Regardless of variant, every Ripple comes with IKBS (“Ikoma Korth Bearing System”) which is an uncaged ball bearing pivot used to reduce friction when opening, allowing the Ripple to flip open like knives costing many times it’s reasonable price tag. If you’re looking for classic Ken Onion ergonomics but don’t want to deal with Kershaw’s Speed Safe mechanism, the Ripple is highly recommended! The Mel Pardue-designed 530 series is often forgotten about when people talk about the Benchmade brand. It’s been around for quite a while, and it’s not a flashy framelock flipper like what’s all the rage these days. The 530 is a seriously cool knife that packs a lot of blade into an extraordinarily light package, handily beating out Benchmade’s yardstick EDC knife – the 940 – on the blade to weight ratio. While the 940 packs another .15” of blade, it also weights a full ounce more in standard aluminum trim – and we’re talking about a 2.9 ounce blade here. The 530 is an incredibly light knife at 1.88oz – especially when you consider it has an axis lock, which is slick but isn’t exactly light and contains multiple moving parts. The 530 achieves that low mass through two primary factors – one, it’s extremely thin. The handles measure only 0.37” in cross section – so the 530 feels like several credit cards stacked together in hand. There are no liners, and the handles taper as they extend out towards the tail end. Although it’s extremely thin, the 530 doesn’t skimp on ergonomics – with a swell towards the tail to fill the palm and a gentle curvature mid-frame to give some depth to the grip the 530 never feels like you’re choking up on a piece of Saran Wrap to do some cutting – a remarkable trick considering it’s thin enough to be forgotten in laundry when you change clothes. 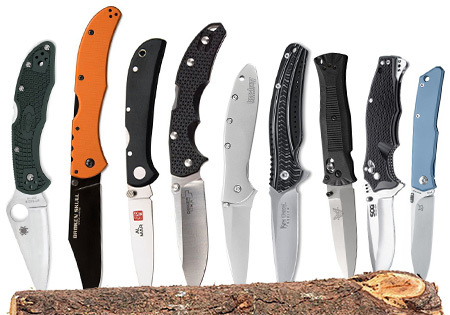 The 530 is available as the normal version for around $100 – which has polymer handles (Benchmade calls them Noryl GTX, which sounds like a brand of motor oil) that will be familiar to owners of Griptilians, or the newer 531 which trades out the plastic handles for herringbone patterned G10 with a weight increase of 0.2 ounces. Both versions use a 154CM blade, the 530 being a spear point shaped blade and the 531 being a more practical drop point – each are available as a satin finish or black coated blade, in plain edge or partial serrations. There was also a limited edition Gold Class 530 that had black and green G10 handles and a Damasteel blade (now out of production) if that’s your thing. Regardless of which variant you choose, the incredibly thin carry, light weight, and smooth axis lock action is sure to be a satisfying combination! SOG isn’t a brand that gets a lot of love among knife enthusiasts, and it’s not hard to see why. A lot of their products are sold next to Gerbers at big box retailers like Dicks or Wal-Mart. Many of their products focus on cheesy tactical details and assisted-opening blades that scream “I’m an operator!” to any terrified nearby witnesses. The Twitch II, a favorite of Nutnfancy, is a legitimate turd of a knife – slick handled, a wobbly blade, handle-heavy, ugly, and just – no. No. You can do better. How much better? Well, the Vulcan series are legitimately great knives. And while the full size Vulcan is the figurehead of the SOG brand, the Mini Vulcan is a more pocketable EDC-sized knife that weighs in at a scant 3.4 ounces. It’s a pretty thing to look at: organic curves, a chamfered thumb ramp molded into the scale, the liners standing proud at the tail with the SOG logo – and the blade is a looker, too. Available in three different styles – a satin finished or blade coated drop point blade, or a bright satin finish Japanese-style Tanto (a curved forward edge, as opposed to American tantos which have a straight forward edge and a harsh transition) made from San Mai VG-10 – a laminated core. A gentle recurve on all the models increase the effective cutting edge length and isn’t hard on the eyes, either. The party piece of the Vulcan series is the Arc-Lock: SOG’s proprietary lock that works similar in function the Axis lock, but it travels in an arc forward and down when engaged. It uses a spring to engage the cam and provide a detent for the flipper tab – while keeping side loads off the blade – and as a result flips open very well. The Mini Vulcan provides remarkably good value – some of the best quality grinds in the business, sleek good looks, a slick and strong lock (tested to over 1000lbs of lock strength) – all for under $100. Kizer is a relatively new name to the cutlery scene, and they (along with brands like Reate, Stedemon, WE Knives, and others) are doing their best to change the stigma of Chinese-owned knife companies from being bargain basement budget special brands to actually respectable purveyors of sharp things. They’ve made a point to collaborate on as many products with well-respected designers as possible, with names including Michael Vagnino, Matt Cucchiara, Ulrich Hennicke, John Gray, Matt Degnan and others. And although there are plenty of stars among Kizer’s lineup, none shines as brightly at the EDC game as the Gemini. The Gemini is designed by Ray Laconico, and is a “re-imagined” production version of his custom knife, the Jasmine. The Gemini does a rare trick: it’s an objectively better knife at a lower price point with higher production numbers than the custom it replicates. For one thing, the Jasmine retails for around $800 depending on features on Arizona Custom Knives, or about 5 times what the full-featured Gemini sells for. The Gemini also has features that are absent from the Jasmine – contoured handles, a ceramic ball bearing pivot, and CPM S35VN steel versus Laconico’s D2 tool steel. There are two different levels of Gemini available from Kizer: the original version has the contoured titanium handles, anodized blue accent hardware and pocket clip, and the stonewashed S35VN blade for about $170. There’s the newer Vanguard line, which is Kizer’s move to bring their prices downmarket: with G10 scales over stainless liners (either in black with a bright blue backspacer, or green with a black backspacer) and a stonewashed VG-10 blade, they’re only about $80. Both versions are within spitting distance for weight: 3.58oz for the Vanguard, 3.65 for the full Titanium version, both with a 3.125” blade length. The full flat ground drop point blade shape is the epitome of practicality, and Kizer is already making waves as being one of the best and smoothest flipper manufacturers on the market – these knives pop open with incredible speed and a satisfying “flick.” If you’ve been wary of Chinese folders, this is a solid piece of evidence there is much to look forward to – and a great lightweight EDC. The last entry on our lightweight EDC list is another undiscovered gem of the cutlery industry. Designed by one of the biggest names in tactical knives, the Terzuola folder is a production collaboration between Bob Terzuola and Italian manufacturer Fox Cutlery, who also produced the striking Volpe folder for Spyderco years ago. It’s unmistakably a Terzuola design, from the long thin drop point blade to the thumb disc opener and the slim box shaped handle. When closed, the blade barely stands proud of the liners making it a slim pocket carry, yet packing 3.5” of blade it’s beefy enough for more serious tasks. The blade is made of Bohler N690Co steel – a solid, corrosion-resistant mid range stainless steel that balances edge retention and ease of maintenance nicely. Other nice touches on the Terzuola include a dual-purpose stainless lockbar insert – to prevent lock stick between the stainless blade and the titanium handles – that also functions as a Hinderer-style lockbar overtravel stop, which can be removed and replaced if the need arises. Open construction with hourglass shaped standoffs makes cleaning the knife easy and reduces weight. On the aesthetic front, oversized pivot hardware and a 3D machined titanium pocket clip make the Terzuola look a lot pricier than it is. You can pick from regular silver or a blue anodized finish for the titanium-handled Terzuola, or if you want something a little “dressier” there’s also a version with a Damascus blade and Bokote wood handles over stainless liners for another $20 and an additional half-ounce of weight. Regardless, all versions are sure to be both great daily users and impressive to anyone that lays eyes on them. So that wraps up our guide to the best lightweight EDC knives. Did we miss your favorite lightweight knife? Let us know by getting in touch.